Ichiro Suzuki received an emotional send-off as he retired after a 28-season career in which he broke several Major League Baseball records. 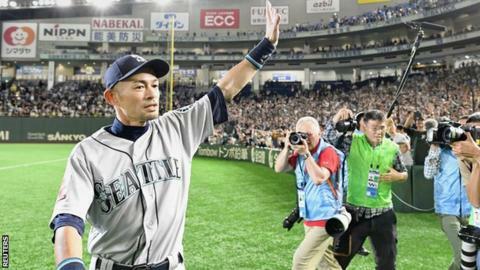 The Japanese player, 45, featured in his last game for the Seattle Mariners in a win over the Oakland Athletics at the Tokyo Dome in his homeland. He retires as the record foreign-born MLB hitter with 3,089 hits. "Someone will eventually come along and break my records," he said. "Secretly I'm proud of what I've achieved." Suzuki moved from Japan to join the Mariners in 2001 and after spells with the New York Yankees and Miami Marlins, returned to Seattle in 2018. After grounding his final bat against Oakland, he left the Tokyo Dome field to prolonged applause and cheers, before returning from the tunnel to acknowledge the 54,000 fans. "After 28 years in professional baseball, it was unbelievable to go out on a note like this," added Ichiro, a 10-time MLB All-Star. "I never imagined I would see a Japanese crowd so passionate. It was such a special moment." In 2004, Suzuki broke an 84-year-old record for hits in a single season, finishing with 262 - five more than baseball legend George Sisler produced in 1920. He retires with the most hits of all Japanese-born players in MLB history. He also became the first Major League player to record at least 200 hits in 10 consecutive seasons. That achievement was marked with a commemorative stamp in Japan.